When I learned how to make stuffed grape leaves, it was really to see if I could make them better than what I purchased. I liked them but I thought I could improve the flavor. Many people told me that it was an acquired flavor which I would eventually get. Instead, I thought that the ones which were served to me in restaurants simply lacked in flavor. As I was researching my information and recipes for this Greek food, I found so many different spellings. I am not that familiar with Greek so this was rather confusing. I have found recipes detailing how to make stuffed grape leaves spelled “dolma, dolmathes, dolmades and dolmadakia”. What do all these mean? It seems that “dolma or plural dolmas” is a Turkish word meaning to be stuffed. This usually applies to vegetables which are hollowed out and stuffed. Other than this, I am lost as to the different spelling. I know that the Greek restaurant where I go (And they are Greek!) call them dolmadakia. Since I have learned how to make stuffed grape leaves, I found the biggest problem is finding good grape leaves. The preferred ones to use are fresh ones. This means you must have access to grape vines. You should select them in the spring when they are young and tender. After cutting from the vine, trim the stems off and wash in cold water. Parboil for 5 minutes in boiling water; drain and rinse in cold water. You can use them immediately or freeze them for later use. 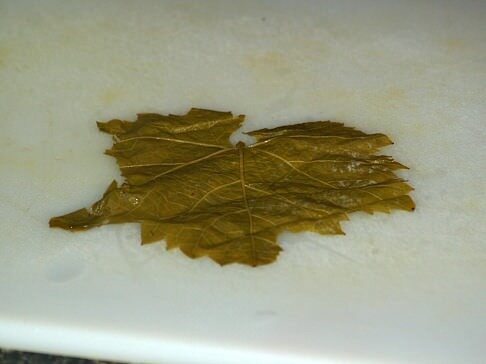 To freeze the grape leaves, layer them on sheets of wax paper. Roll the sheets up like a jelly roll and place in large freezer bags. HOW TO CAN YOUR OWN GRAPE LEAVES? Since I learned how to make stuffed grape leaves and I love them so much I learned how to can the leaves. Combine water and salt; bring to a boil. Wait 30 seconds and drain in colander; reserve liquid. Stack leaves 10 to a stack; roll in loose rolls and pack vertically in pint jars. Add the lemon juice to the liquid and bring to a boil; pour liquid in jars covering grape leaves leaving ½ - 1 inch headspace. Place lids on jars; process in HOT WATER BATH for 15 minutes. I always buy grape leaves canned in jars. There is a lot of inconsistency in the quality of canned leaves. If you find a brand you like try to always purchase the same brand. My problem has been that each time I buy them, I am only offered one brand and it is always different. The last ones I purchased were very tough which is a common complaint. The leaves were larger and “pretty” with a heavy “vein” showing which was an immediate sign to me that they were processed when too old. NOTE: Try cooking stuffed grape leaves in a pressure cooker. It is a good way to tenderize these grape leaves. I searched through all my recipes when I was learning how to make stuffed grape leaves. Some have beef, pork or lamb included in the recipe while others have no meat at all. I actually love the ones with rice and no meat but they do have a lot of flavorful vegetables and herbs. Don’t get me wrong, the ones with different meats are also delicious as long as they have good seasoning. Like I said, the biggest problem is with the grape leaves. Below are some of my favorite recipes plus good sauce to serve with them. 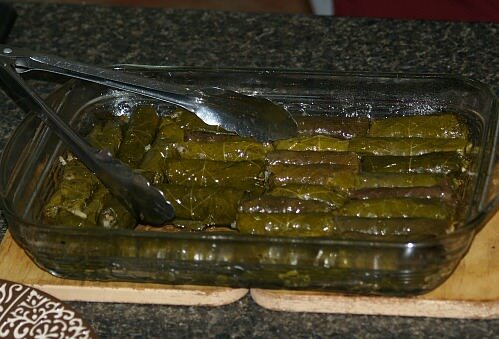 Once I learned how to make stuffed grape leaves with this recipe, I find it hard to make other recipes. Although these do not contain meat, I love the flavor. Drain grape leaves, rinse in cold water and drain in colander. Sauté in a large skillet the onions and green onions in ¼ cup of the olive oil for about 3 minutes. Add to the pan the rice, salt, pepper, parsley, dill, mint, sugar, ¼ cup lemon juice, another ¼ cup of olive oil and 1 cup water. Cover and cook for 15 to 20 minutes until rice is tender. Cover bottom of Dutch oven with torn or tough grape leaves. Place grape leave with vein side up; spoon 1 tablespoon filling at base of each leaf. 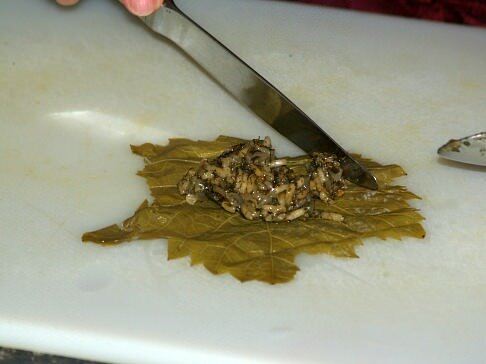 Roll leaves into small cylinders; layer in Dutch over on top of layer of grape leaves. Add enough water to cover stuffed grape leaves; place inverted plate on top of rolls. People love to learn how to make stuffed grape leaves with meat. These are more filling than the meatless recipes. 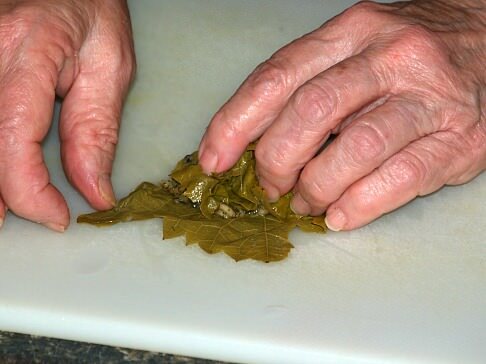 Rinse grape leaves; let stand in warm water while preparing filling. NOTE: If leaves seem to be tough simmer for 10 minutes to soften. Combine ground meat with salt, pepper, oil, onion, rice, juice from 1 ½ lemons, parsley, dill and mint. Add ¾ cup of water to make a soft mixture. 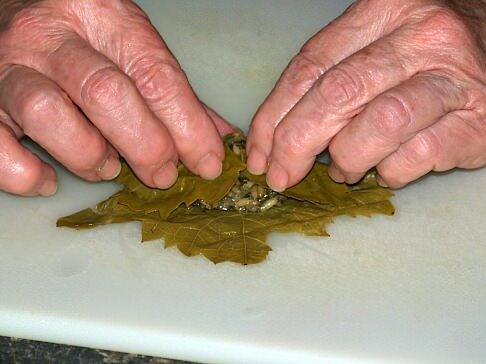 Place grape leaves with rib side up; spoon 1 teaspoon filling on each leaf and roll into narrow rolls. 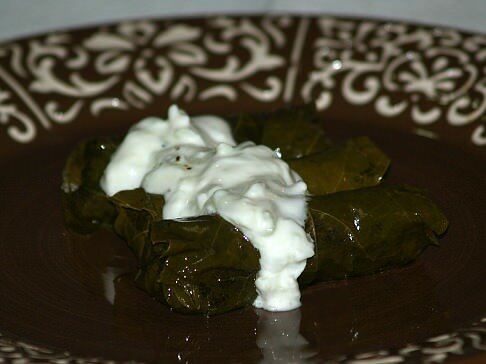 Place a layer of grape leaves in the bottom of a deep pan; arrange dolmades in layers. Add broth, butter and 1/3 cup of lemon juice; cover rolls with an inverted plate. Simmer for 45 minutes or until rice is tender. Drain grape leaves and rinse under cold water; snip off stems. Mix together meat, rice, onion, oil, salt, pepper, mint, dill and water. Spread torn leaves on bottom of Dutch oven. 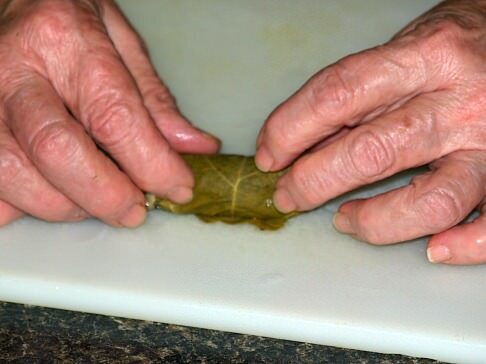 Place 1 tablespoon of filling on each of the grape leaves; fold sides over and roll up. Layer in Dutch oven with seam side down; doting each layer with butter. Add beef stock and enough water to cover the dolmathes; weight rolls down with inverted plate. Bring to a boil; reduce heat and simmer for 50 minutes. Shift pan to keep from sticking; DO NOT LET rolls get dry. Pour sauce over dolmathes to serve. I learned how to make grape leaves with this recipe because of the added tomatoes and different flavors of spices. Wash grape leaves several times with warm water; drain and set aside. Combine in a large bowl the rice, lamb, minced garlic, salt, coriander, pepper, cinnamon, allspice, cayenne and about half of the tomatoes. Place a layer of torn or the tougher grape leaves in the bottom of a Dutch oven. Place a tablespoon of the filling on each grape leaf; roll into cylinders tucking in the ends. 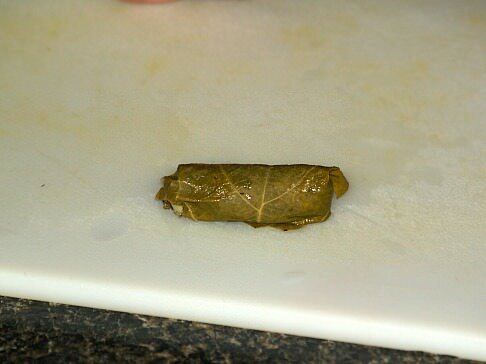 Arrange the rolls on top of the layer of grape leaves alternating the directions of each layer. Top each layer with some of the remaining tomatoes and garlic cloves. Top with inverted plate; add just enough water to cover the stuffed grape leaves rolls. Bring to a boil and cook over medium heat for 1 hour or until meat and rice are done. NOTE: Make sure Dutch oven does not go dry. Add lemon juice and cook a few more minutes. When I learned how to make stuffed grape leaves, I also learned how to make this sauce to serve with them. 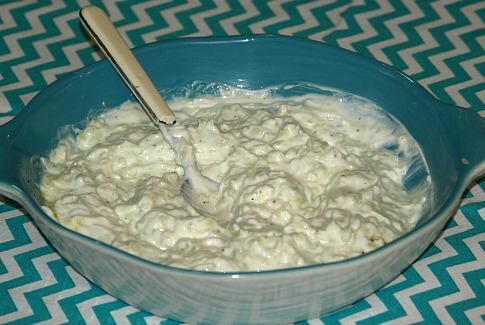 Drain yogurt overnight in a cheesecloth lines colander. Place cucumber, garlic, olive oil and vinegar in food processor; process until smooth. Add yogurt to mixture; season with salt and pepper. Refrigerate 1 hour before serving with dolmathes. Many who grew up learning how to make stuffed grape leaves prefer this sauce to serve with them. Combine in a mixing bowl the eggs, water and lemon juice; blend well. Gradually add some of the hot liquid from cooking the dolmades until eggs are warm while beating. 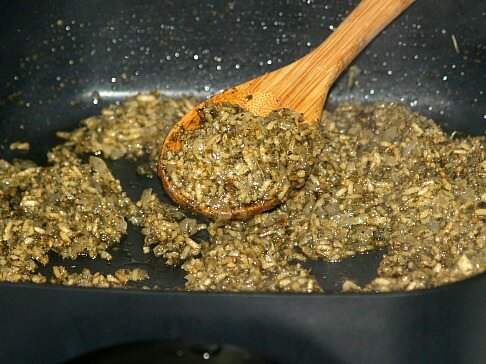 Remove pan from heat and pour over dolmades to serve. Combine yogurt and broth; set aside. In a medium saucepan dilute cornstarch in water; add eggs and beat well. Add lemon juice, salt and pepper while beating; fold in yogurt mixture. Place over low heat stirring until sauce thickens like heavy cream. DO NOT BOIL.